Meringue is an underrated dessert, in my opinion. Probably thanks to the chalky, mass produced bright white meringues that most associate with this confection. It’s a shame because a homemade meringue baked just right couldn’t be further in taste and texture from those dry and overly sweet disasters you can buy in a box. Like a few other things, once you see how easy it is to make it and how much better it tastes, you’ll never buy them again. The key to a successful meringue is a clean bowl and utensils. In order to do this, take a little vinegar on a paper towel and wipe the inside of your bowl and the beaters. If using a Kitchenaid mixer, wipe the whisk attachment with the vinegar. This removes any traces of fat from your equipment that will inhibit the egg whites from foaming and increasing in volume. There are three different types of meringue: French, Italian and Swiss. I prefer the Swiss method as I find it ensures all the sugar dissolves and makes for a very smooth and velvety meringue. In order to accomplish this, you heat the egg whites and the sugar over a pot of simmering water for a few minutes. This dissolves the sugar into the egg white before you begin. Preheat the oven to 215°F. Line a baking tray with parchment paper. Fill a medium saucepan with about 2 inches of water and bring to a gentle simmer over medium heat. Prepare the bowl of a standing mixer by thoroughly wiping the inside with a paper towel dampened with white vinegar. Add the egg whites, sugar, and cream of tartar. Place the bowl over the saucepan of gently simmering water, making sure the bottom of the bowl does not touch the water. Whisk constantly, until the sugar has completely dissolved, about 5-7 minutes. To check if it is ready, rub a bit of the mixture between two fingers; if you do not feel any grains of sugar, then the sugar has dissolved. Make sure to whisk constantly during this step because if left unattended, the bowl can become too hot and the eggs will start to cook. Transfer the bowl to the standing mixer fitted with a whisk attachment. Whisk for about 10 minutes, starting on low speed and gradually increasing to high, until the whites increase in volume and form glossy, stiff peaks. Drizzle the melted dark chocolate into your bowl and then turn out the entire mixture with a spatula onto your prepared baking tray. Spread the meringue into a rectangle. 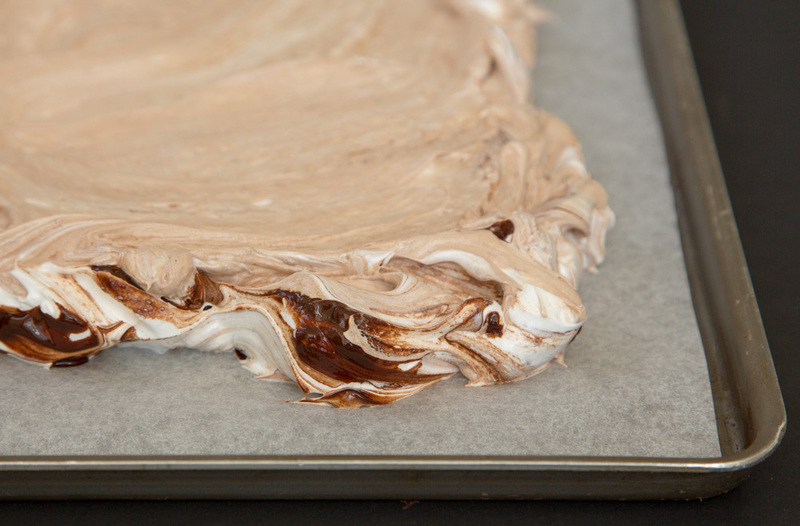 Try not to overwork or you will lose the lovely chocolate swirls in your meringue. Bake in the oven for approximately 1 hour 15 minutes. The longer you leave it in the oven, the drier your meringue becomes. I find after 1 hour and 15 minutes, the outside is crisp and the inside is soft. Remove from the oven and allow your meringue to cool on the baking sheet placed on a wire cooling rack. While the meringue cools, whip the cream and sugar together in a large bowl until soft peaks form. Spread the whipped cream over the completely cooled meringue and top with the mixed berries.